Atlanta’s POYNTE have released a lyric video for “Take Control”, the first track from their debut full length album Discreet Enemy, available February 17th via THC : Music/Ingrooves. Written and refined over the course of a year, the band recorded Discreet Enemy over a 60 day marathon in the band’s own studio, Covington, GA’s The Audiovault, with additional recording by Mike Froedge (Black Label Society/Double Drive/Bloodsimple) at Open Sky Studio. Discreet Enemy was mixed by acclaimed producer/mixer Andy Reilly (The Cult/Iron Maiden/Bon Jovi/The Police) and mastered by Matt Dalton (Chiodos/Hed Pe/Attila/Tantric) at 37 Studios. The band has already received glowing feedback from musical contemporaries like guitarist Nick Perri (Silvertide/Shinedown/Perry Farrell’s Satellite Party/Sinai) AND Black Stone Cherry guitarist Ben Wells, both of whom have publicly sang the praises of tracks from Discreet Enemy. After recording Discreet Enemy, the band approached THC : Music President Thom Hazaert (Switched, Black Light Burns, Attika 7, Chimaira) who signed the band for the release of the LP. The band has also recently been endorsed by Spector Basses, InTune Guitar Picks, Coldcock Herbal Whiskey and Dirtbag Music. POYNTE is a group based in Atlanta, GA, comprised of sincere musicians that still take pride in lyrical content and musical movement. With every single note planned to support the emotion of the song, the band delivers on their uncompromising vision. From the syncopated drum and bass lines, to the layers of guitars that support the vocal melodies, POYNTE is a well-oiled emotion machine that leaves audiences of all ages captivated and wanting more. The band’s vision has always been clear, and that is to write heartfelt music while retaining their commercial viability. Through a relentless and sometimes tumultuous pursuit, the solidified lineup has finally been carved into stone. These five musicians have completely embraced that shared vision, and the musicianship to make POYNTE complete is now in place. This incarnation is what POYNTE has needed to be to take the band to the next level. Vocalist Kenny Hathorne’s voice and vocal melodies have been the key to furthering the band’s song writing. Surviving a scissor lift accident, where he ended up with a titanium jaw replacement, Kenny leaves no doubt that he is destined for something great! Guitarist Brett Davis joined POYNTE nearly two years ago as a bass player. The band knew he played the guitar, but had no idea how much depth and skill he would bring to the band. His transition to guitarist was flawless and his backing vocals, combined with his screaming abilities, have proven to be a key element in the evolution of the band’s sound. The final element, and possibly the most crucial, was the addition of drummer Josh Fulcher and bassist Jake O’Donnell in August 2013. Josh, coupled with bassist Jake O’Donnell’s energy and his 90’s Alternative background, have solidified the sound that POYNTE have long searched for. While previous POYNTE lineups have had some success, the group senses their best days are yet to come. Some of their accomplishments include winning the 2012 Ernie Ball Battle of the Bands, which earned them a slot on the RockStar Uproar Festival in Atlanta, as well as winning the 2012 Cabo Wabo Your Shot to Rock. 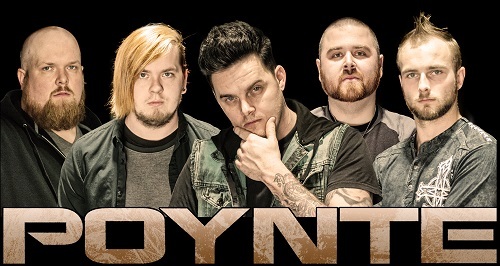 POYNTE has also shared the stage all across the Southeast with national acts such as 10 Years, Nonpoint, Shinedown, Godsmack, Papa Roach, Saliva, Drowning Pool, Fuel, All That Remains, and Taproot.